Do we need electricity? What do you think? The other week H’s class at school were having a discussion about whether we really needed electricity or not. I think his year 2 class were generally of the opinion that we didn’t need it, but it was very useful indeed. The class teacher asked ” Does anyone think we need electricity?” H put his hand up to answer. His answer was yes and when he was asked to justify why he thought that, he said that our brains use electricity. I’m sure his teacher thought something along the lines of there’s always one! But as his mother, I’m very proud of H for knowing that and not being afraid to say it in front of the whole class. He’s always been very interested in science and how things work, so he’s built up a good knowledge of scientific facts for a 6.5 year old. He was also chuffed, this weekend to be told by doctor friend of ours, that our hearts also need electricity to beat. More facts to back up his statement that we do need electricity. As time goes on we seem to get ever more reliant on electrcity. Clever H! I think it’s great that he felt confident enough to put forward an argument, and I can see why’d you be so proud. Interesting discussion, too. The Reading Residence recently posted..Girls Trip! awww Erica what a clever boy H is!! i have to admit i am a fan of electricity myself and find the whole concept somewhat interesting! Hehehe so clever! Good on him! What a clever boy! I would be lost without electricity – what would we do at night if we couldn’t watch tv or tootle on the laptop! Good for H! No wonder you’re so proud of him. Wow, well done H. That’s fantastic. Children can be very absorbing of information when they are interested in it. reminds me of a dara o’birian sketch where he talks about electricity and most parents could answer kids questions up to the point where the electricity goes into the wall….and then they were stumped! He’s such a clever boy! I wouldn’t have know that at 6.5! You have good reason to be proud of him! He’s got a good point hasn’t he? 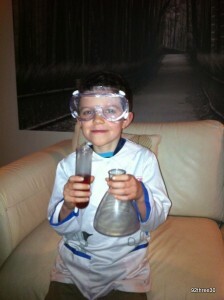 Will be a real scientist one day. WOW you learn something new everyday! You must be so proud that he wasn’t worried about putting his hand up and expressing his opinion. I hope the class got told why his answer was correct and they all learnt something new that day.